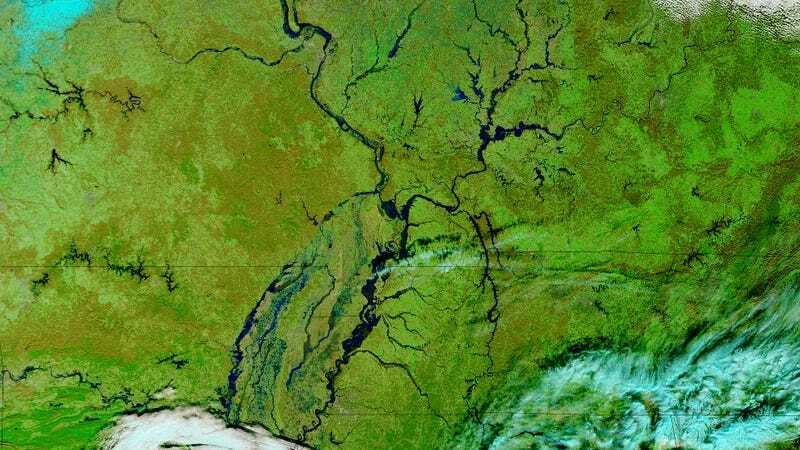 Unusually heavy rainfall and severe storms in parts of Missouri and Illinois late last month are now causing the Mississippi River to surge, threatening a number of communities with severe flooding. Between December 26 and December 28, 2015, some six inches of rain fell on 50- to 75-mile-wide region of middle America. Some areas recorded upwards of 10 inches. By New Year’s Day, the Mississippi River had bloated to its third highest level ever in St. Louis. Meanwhile, Records fell at Cape Girardeau, and floodwaters breached levees in several locations, including Miller City. The ensuing flood threatened some 500 inhabitants in the nearby Illinois townships of Love Branch, Hodges Park, and Unity. Yesterday, the Mississippi River at Baton Rouge crested at 35-feet. On January 3, 2016, NASA’s Terra satellite took a photograph of the flooding. For comparison, a second picture was provided, showing normal conditions for this time of year. The images appear in false color, where water is blue, vegetation is green, and bare ground is brown. According to officials, the flood waters will continue to sweep southwards in the coming days. Warnings have been issued in Tiptonville, Tennessee, Memphis, Tennessee, Helena, Arkansas, and New Orleans. Bob Holmes, a Missouri-based hydrologic engineer for the U.S. Geological Survey, says the Midwest has received far more rainfall than normal over the past quarter of a century, and more extreme rainstorms, such as the three-day downpour Dec. 26-28 that dumped 10 inches of rain over much of Missouri and Illinois and caused this latest mess. But urban sprawl also increases flood risk, he said. Bob Criss, an earth and planetary science professor at Washington University in St. Louis, also blames urbanization, and says this latest spike of rain wouldn’t have caused major flooding if the river wasn’t constricted by levees and floodwalls. “The Mississippi River behaved during this event like a small river, and it’s acting like a small river because the water has no place to go,” Criss said. In its defense, the Army Corps of Engineers says the system prevented an estimated $230 billion in damages back in 2011 when the river south of St. Louis experienced its worst flooding since 1993. Email the author at george@gizmodo.com and follow him at @dvorsky. Top image by NASA image by Jeff Schmaltz, LANCE/EOSDIS Rapid Response. Caption by Adam Voiland.